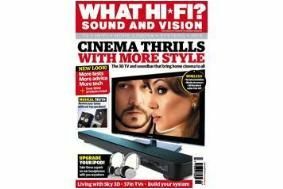 February 2011 issue on sale now | What Hi-Fi? Our bumper review-packed February 2011 issue is on sale now, don't miss it! This month we've got a Supertest of 37in flatscreen TVs, Group Tests of stereo speakers from £380-£450, projectors for around £2000, media streamers including Apple TV, on-ear headphones plus a roundup of subwoofers to boost your bass. Other treats in store include First Tests of Yamaha's brilliant new YSP-220 soundbar, Arcam's long-awaited BDP100 Blu-ray player, another Yamaha in the form of its RX-V3067 multichannel receiver, a 40in 3D telly from Toshiba, a compact 5.1 speaker system from Tannoy, Philips's latest 32in Ambilight LCD TV and Sony's first big-screen 3D projector. That not enough for you? Then check out our Temptation section in which we take an extensive look and listen to dCS Puccini's two-box CD player, top-quality Diapason Astera hi-fi speakers, Samsung's 65in UE65C8000 3D TV and a pair of Grado PS1000 headphones. And in The Big Question, three readers decide if changing a digital cable can affect the sound of your music. Cue plenty of teeth gnashing on our Forums. Our Jargon Buster deciphers all the tech terms related to home cinema projectors, and we've spent a month living with a Sky+ HD 1TB box, putting it through its paces in a long-term test. As for news, we reckon 2011 could be the year in which music streaming finally becomes mainstream, and we've interviewed Paul Franklin, the visual effects supervisor behind Inception. And don't forget you could win one of ten pairs of superb KEF Q300 hi-fi speakers in our latest competition. Click here to enter. All this and more is in the February 2011 issue of What Hi-Fi? Sound and Vision, on sale now.